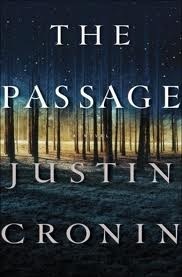 I just finished reading The Passage written by Justin Cronin! It was amazing. Literally the best book you’ll ever read, that you’ve never heard of. I think so anyway. I had never, heard of this book until I came across someone’s blog who had mentioned that it was a great read, and that it was nearly 800 pages long. I did some research and read some reviews on amazon.com and decided it was worth it to give it a shot, so worth it! I still haven’t heard anyone else mention this book before. It seems that it hasn’t quite caught on with people yet…but it will! I have no doubt about it. The Passage is set in the future, but not too far into the future. The story is about vampires, although they really never use the word vampire. They have their own names for the creatures that were created and who changed the entire planet. It’s nothing like Twilight, or any other vampire story you’ve ever read. This book gave me some crazy nightmares. The other person I know who’s read it had nightmares too. I’m telling you, it’s quite a book that can get inside your brain like that. Justin Cronin manages to get you attached to so many of the characters throughout the book. My favorite is a girl named Amy, who you learn about at the beginning of the book. I liked the first couple hundred pages of the book the best. There is a part after that that is kinda dry and a bit hard to get through. Mainly it is trying to get a grasp on several characters that get introduced pretty much all at once, and with strange names to boot. After that though it gets really good. I literally spent most of the last two days doing nothing but reading so that I could find out what was going to happen. I literally could not put the book (kindle) down! A friend of mine also read this (she finished it first) and we both came to the conclusion that the author left it wide open for a second book. After looking online I found that it’s supposed to be a trilogy, and they are making a movie(s). I can’t tell you how excited I am for the next book(s) to come out! I wish I had an idea of when they are going to be released, but I have no clue. I really can’t say enough good things about The Passage! If you don’t believe me, you’ll just have to find a copy for yourself and see what you think!